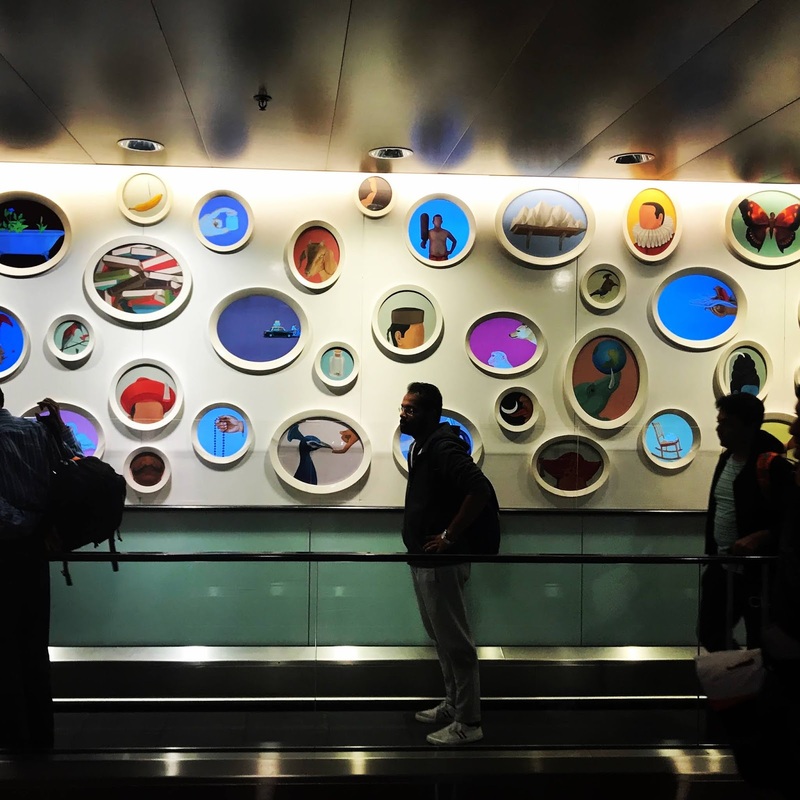 This blog will document our experiences as we live through a year in each others' roles in foreign cities. Samantha will be teaching at Cairo American College and living in Cairo, Egypt. Trillian will be at the American School of Bombay, in Mumbai, India. We are both thrilled for this opportunity and hope that it provides professional growth for us personally, for our teams and our schools, as well as exciting cultural experiences and other benefits we haven't dreamed of yet! Our CAC Pre-K parent community is supportive, visible and very interested in developing the ways in which their children approach learning. 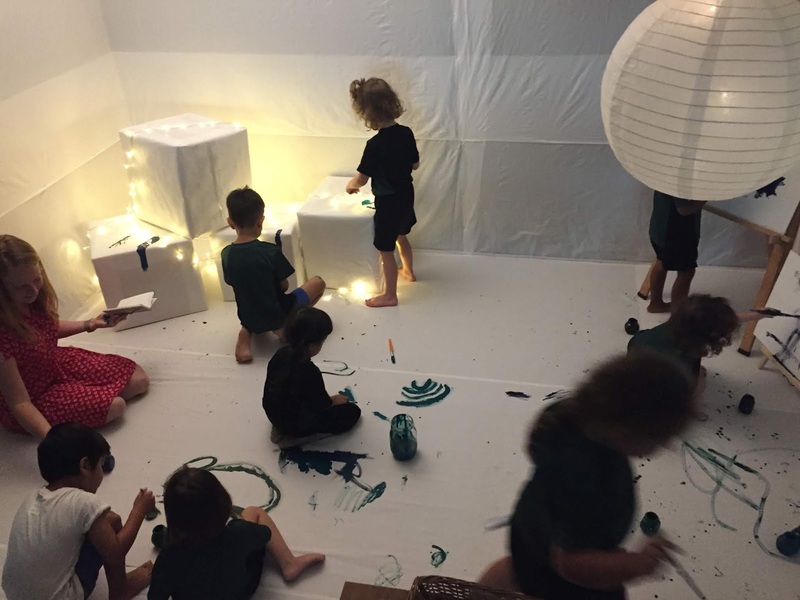 Many of the children in my current class have older siblings at CAC and the families are somewhat aware of how play-based learning looks and feels. They are receptive to what they are reading in our blog and provide us with feedback that is positive and affirming. To further strengthen these important home-school connections, our KG and Pre-K teams decided to hold a series of Community Meetings to delve a bit deeper into some of our approaches to learning. Our administrators were extremely supportive of our decision to hold the Community Meetings at two different times on the same school day, to ensure that there was a chance of one hundred percent attendance. 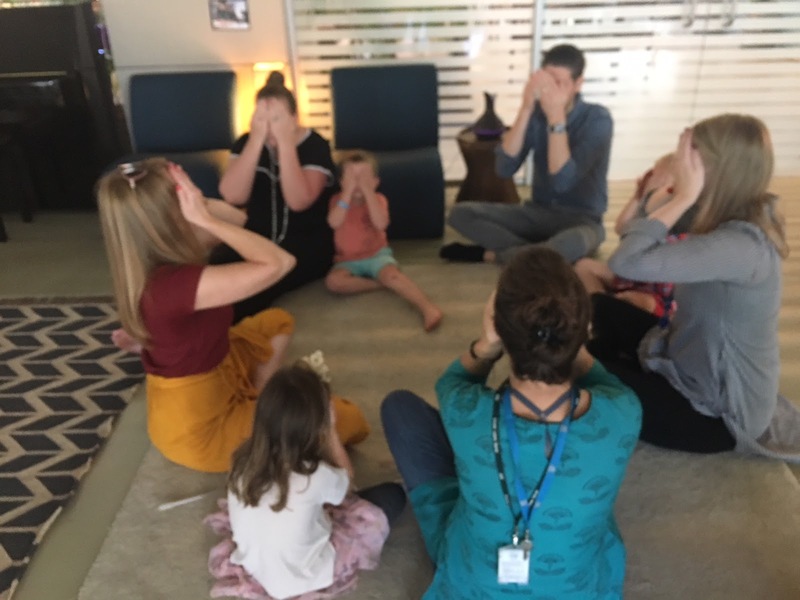 They offered to provide cover for the morning session so the children could be interacting outside while we hosted their parents in our indoor learning spaces. I wanted to share with the families some of my beliefs around the notion of the environment as the third teacher and setting up intentional learning spaces to provoke inquiry. The parents were very interested in knowing more about this. I ended the session with a tour of our room and spoke briefly about the documentation panels we create to showcase student learning and we looked carefully at how and why provocations are set up and in what ways the children choose to inhabit these spaces. 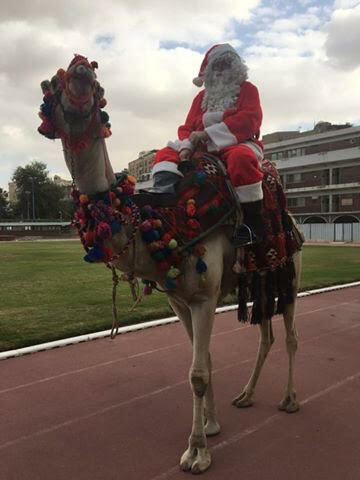 Another highlight at work was my first time ever to witness Santa visiting school on a real-life camel. It doesn't get any better than this! Yes, this really happened at the CAC Winter Holiday event! Professionally, it was so lovely to work with our Arabic teaching team to plan a field trip to a working farm. 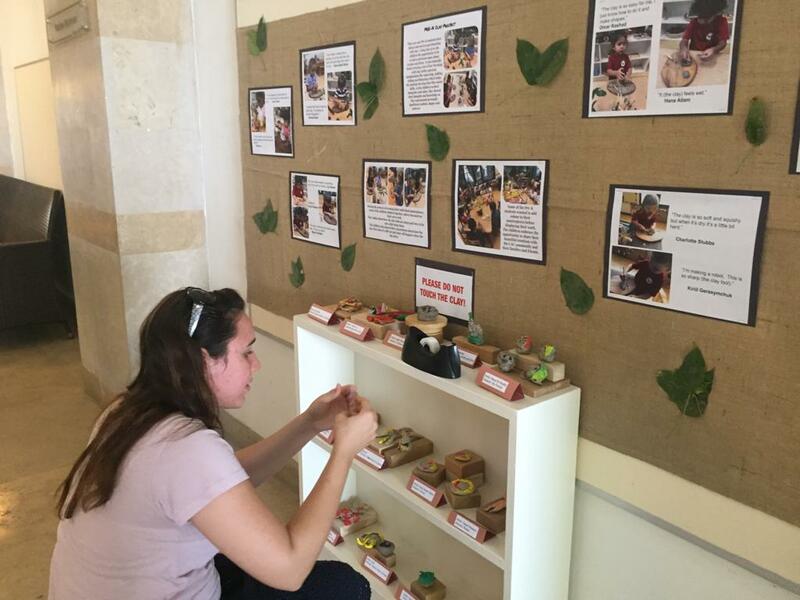 The children gained so much firsthand knowledge about animals and plants that are indigenous to Egypt. 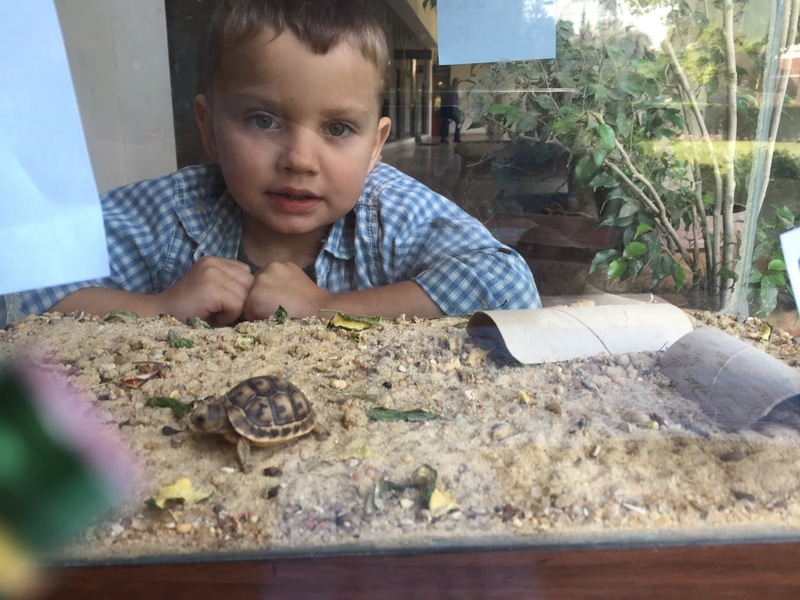 Living in a largely urban environment, unfortunately, doesn't provide many opportunities for the children to witness plant growth and to observe wildlife, so we relished the chance to get up close and personal with nature. Recently I have been taking advantage of the cooler weather to get out and explore some more parts of Cairo and its surrounding areas. When my family visited from Australia in December they spent a week visiting sites while I was working. Their first foray into Egyptian history and culture was truly incredible. My family learned much about the way of life in Egypt and together we spent 5 days on a dahabiya, sailing from Luxor to Aswan. Our 100-year-old sailboat was truly beautiful and the crew of 10 were such wonderful ambassadors of this incredible country. 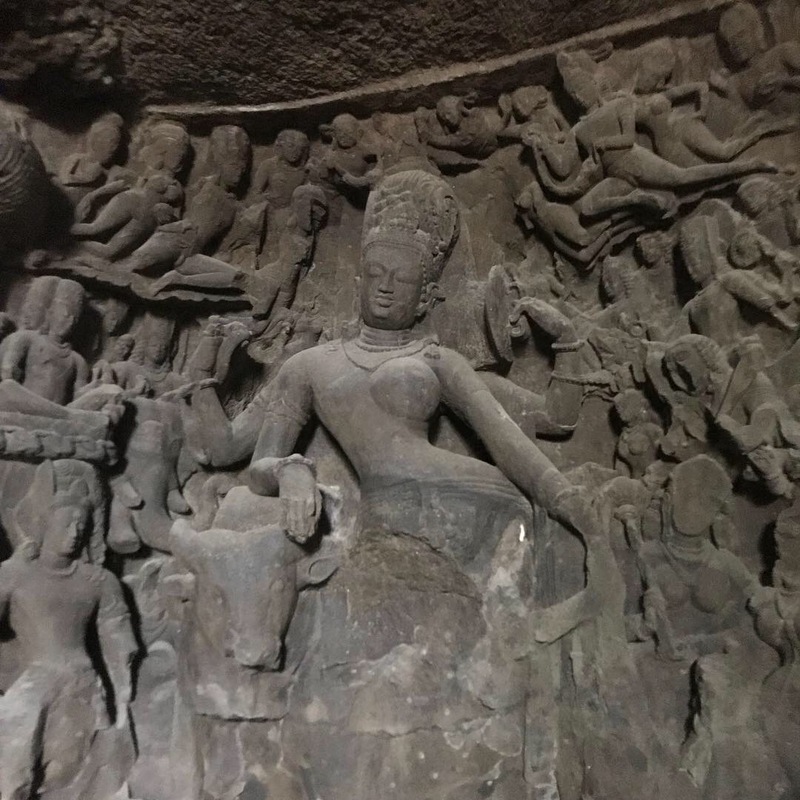 We took fascinating day excursions to villages, museums, tombs and markets. We received the best possible introduction into how people live and work along the majestic Nile. It was honestly the trip of a lifetime. Superb travelling opportunities with team Australia! Our encounters with Egyptian people and history have opened up our eyes to what we had only ever read in history books or seen in movies. 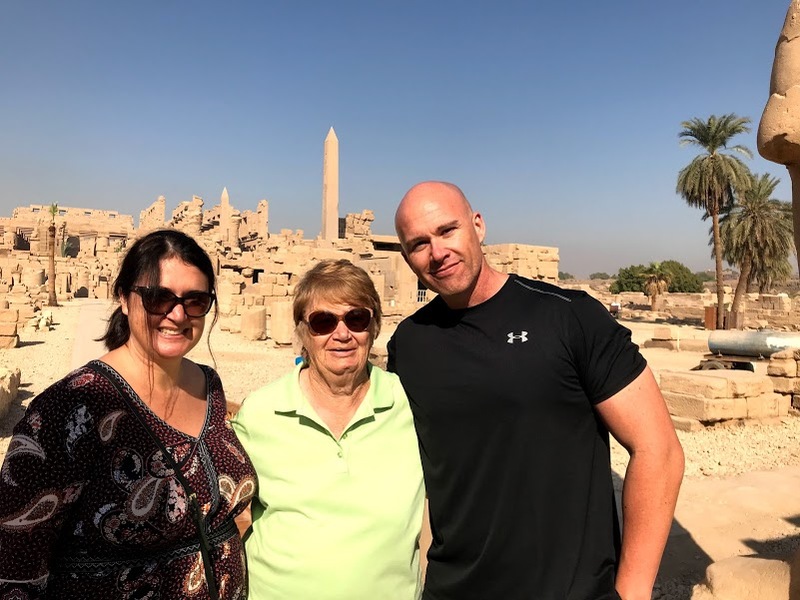 There is a vast amount of opportunities to expand your knowledge when you visit Egypt and doing all of this has immensely enhanced my teacher renewal experience. Finally made it to Abu Simbel - it was truly amazing. Close friends who’ve worked with me in both Zurich and Jakarta come to stay in the lead up to Christmas. Having old friends visit is just so good for the soul! Then my winter break took me further afield to Hurghada to meet up with an old friend from my Munich days. We joined an 8-day liveaboard diving trip. The Red Sea is spectacular and we saw many beautiful reefs and did some extremely interesting wreck dives. I travelled overland to Luxor to meet a friend from CAC and we cruised down to Luxor on a dahabiya. Again, it was a constant reminder of how vast and deep the culture and history of Egypt really is. ZIS and JIS friends - photographer: me! It is truly wonderful to be here and I look forward to continuing on at work and at play, in the fashion to which I am already accustomed. chat to my TA and I. It is truly a lovely community to be part of. collaborative session with our principal to ensure I was moving forward with my professional growth. by a friend on staff and I’ve already used them to take me all over the city and further afield as well. and Dashour and the travel company sent a new guide with us who is a TV presenter here in Cairo. in these few short months. artifacts and made the most of this lovely community of people who surround me. It’s hard to believe we’ve already finished month two here in Mumbai! It feels like I’ve only just begun my journey, while at the same time as if I’ve been here forever. This has been such an incredible period of learning and collaboration for me, and I still have nine months of school to look forward to at ASB. 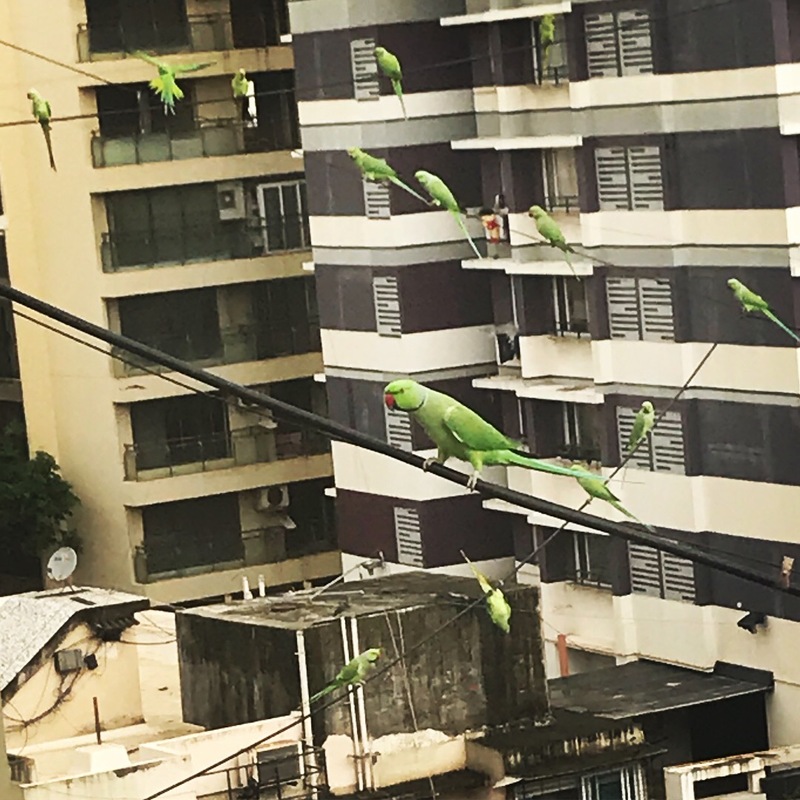 My morning alarm clock in Bandra. Working in an open setting such within Pre-K team at ASB has really allowed my professional thinking and practice to change and grow. In a grade level without walls, where an hour of each day is allocated towards group learning as a whole grade, my beliefs about community and relationships have been re-defined. This is reflected in my interactions with the students, with my teammates, and with colleagues and staff in the school. I have noticed that there are so many opportunities where people take time to compliment others’ practices and construct knowledge together, simply because they are able to interact so frequently. I can’t wait to adapt my own techniques next year, in a classroom with walls, to allow for more frequent interactions with other teachers, students in other grade levels, and colleagues in other divisions to allow for higher levels of collaboration and, in doing so, more opportunities to reflect. Physical walls are a barrier, but not one that can’t be overcome! A Learning Morning session on emotional wellbeing. Within the classroom, things are lovely. We have grown into a special community of learners who enjoy building, drawing, hunting for clues, and helping each other. My associate teacher, Nina, is supportive and wonderful both inside ASB and while helping me navigate Mumbai. Next week we will have parent teacher conferences, and I am excited to spend time speaking with each family about their child’s growth over the first two months of school. While thinking about professional development, I have been a part of a Leadership PLC during my time here with the head of school, Craig Johnson. Today we had the opportunity to sit down for an hour with six heads of school, from Singapore, Johannesburg, Cary Academy (North Carolina), Nueva School (California), Frankfurt, and Mumbai. The conversations, as they have been at all meetings of the PLC, were fascinating. One big take-away and question that I have is, how to foster a culture of zest for innovation at school. How does one create an institution where people are excited about the work they are doing in their classrooms and with their students? I have been very lucky to find this in my international teaching experiences, but I understand that it is not always the case. How did CAC and ASB develop this culture, and what does it take to sustain it? 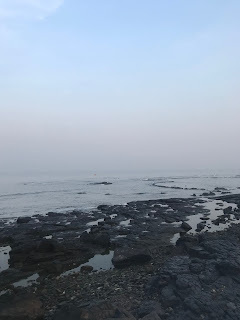 Living in Mumbai is a dream come true for me. 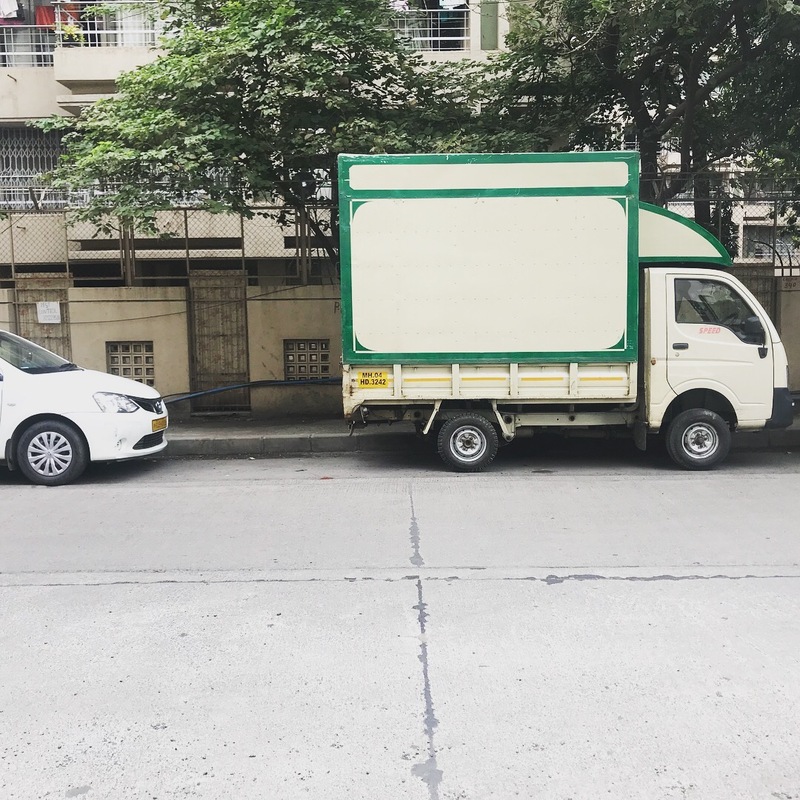 I couldn’t have imagined a better fit. The vibrancy, greenery, busyness, pockets of quiet, and culture everywhere fascinate me. 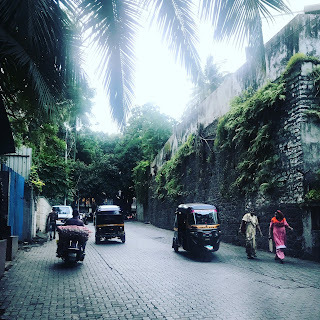 After school each day I go exploring to learn more about my neighborhood, Bandra. 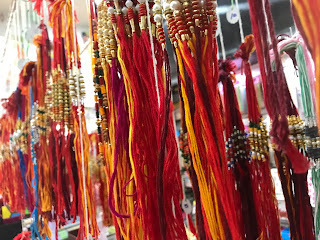 There are plenty of restaurants, and shops galore with treasures like drawers full of beads, reams of fabric, a shop that sells only baskets, you name it. If I went out walking every single day that I was here in India, I would always see something different! Stray dogs in India are generally well-cared for and healthy. Luckily for me they are also friendly! 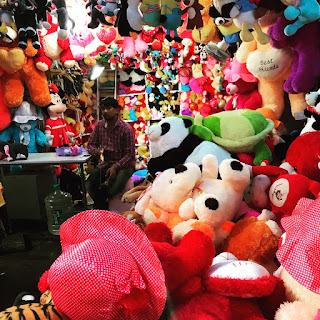 Exploring the markets- a stuffed animal shop. Elephanta Island, home of beautiful temples and temperamental monkeys. We have also had several festivals during August and September. One festival, called Dahi Handi, marks the birthday of Krishna. Because Krishna, according to the texts, loved sweets and would climb high to reach them, this day is celebrated by participants forming a human pyramid to reach a pot placed strategically on a wire or building ledge. The pot is usually filled with money or some other prize rather than Krishna’s favorite treat, yogurt. Thank you to Emma-Jane, my Pre-K teammate, for the video! Another big celebration here in Maharashtra was Ganesh Chaturthi. To celebrate Ganesh, Krishna’s elephant-headed son, the people here create special idols and venerate them for one week. At the end of the week, the idols are brought to the sea with much fanfare, and immersed in the ocean. There are many special songs and chants, and as this is one of the biggest celebrations in Mumbai, the streets were filled with celebrants dancing. 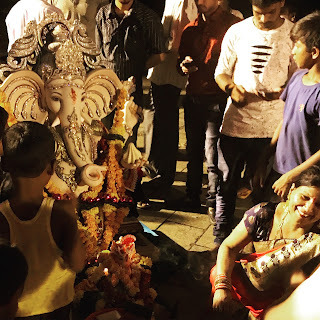 I was lucky enough to be invited by a neighbor to accompany them as they brought their Ganesh idol to the sea one night. A band led the way with drums and firecrackers. The trip took several hours as we stopped every few meters to dance and pass out fruit and sweets to the people on the street. When we reached the sea, the idol was carried out to the water and then several men swam a distance into the sea before letting him go. A wonderful family and celebration. I appreciate so much that a variety of different religious, cultures, and choices are all openly celebrated here. They begin to be a part of the city's identity. I love learning about the publicly celebrated rituals and cultural events here. 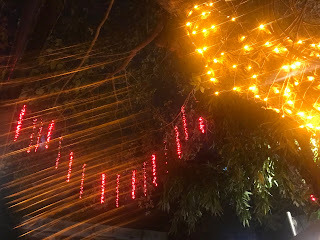 This particular procession, the largest of its type so far on my street, was quite solemn and when I inquired about it, I was only told "this is god." A procession passing my door. I have felt more than welcome here in India and at ASB. The people in my neighborhood make me feel safe as I explore a new city and culture. 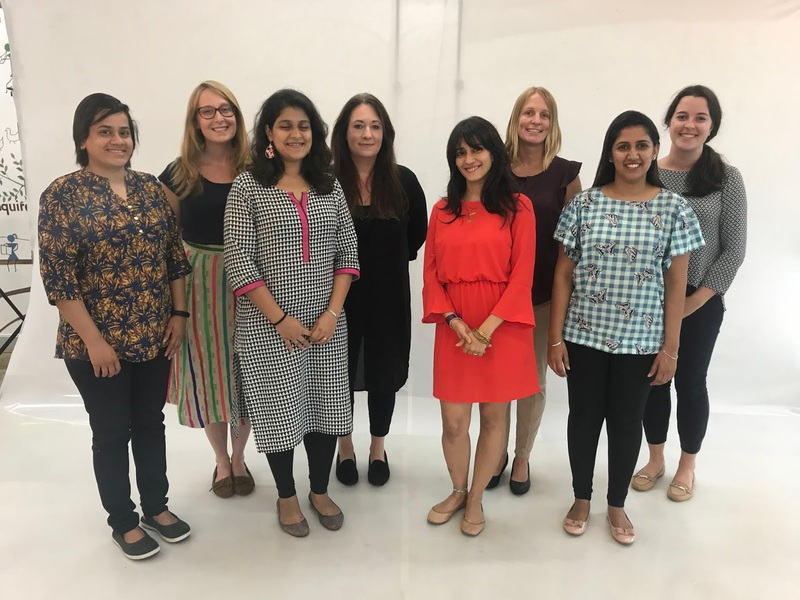 My wonderful team- Marisa, Kate, Emma, Nina, Nilu, Delysha, and Gayle, plus the creative arts, physical education, learning support, iCommons, and host country studies teachers- have helped me reflect on my teaching every day. Professionally, I have been able to join PLC’s that allow me to grow and, more importantly, to apply my learning immediately. 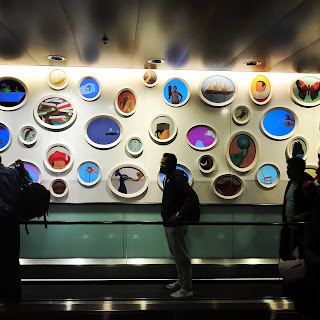 I’m very much looking forward to the next nine months which will include a quick trip back to Cairo, visits from family and friends, travel around India, and more learning at ASB than I can envision right now. Fabulous, fantastic, and supportive Pre-K teaching team. Keep looking ahead- Diwali and more personal and professional adventures on the horizon! A new project Nina and I have just begun as an installation on expression..
look for more on this in the next update! Cheers to the adventure, and another big thank-you to everyone who is making this possible for Samantha and I! It has been made abundantly clear to all of the CAC new hires that in order make the most of our time in Egypt we should be flexible, embrace our new host country and strengthen our ties to the community that makes up this incredible learning facility. From all accounts, we are in a unique and very special place. The communal vibe of the 12 or so new teachers appears to match the schools motto: learn, explore and have fun. I know I am definitely living and working in the right place. My buddy has been an valuable source of information as she has shared her insights and love of this wonderful country. Since my first initial blog post, life has been very busy and filled with moments of the hectic beginning of the school year set up preparations. 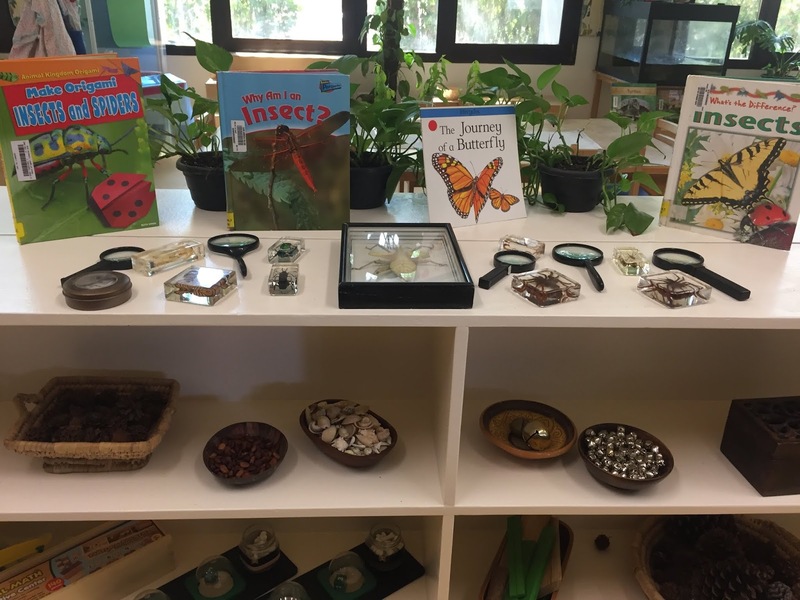 It took much time and energy to organise our physical spaces at work and my Pre-K environment is beautiful. It reflects the importance placed on the environment as the third teacher and has lots of lovely natural light and spaces dedicated to children's work and play. Parent orientation offered me the opportunity to meet with the 13 new families and it is always helpful for the children to spend a few hours in their new classroom the day before school begins. 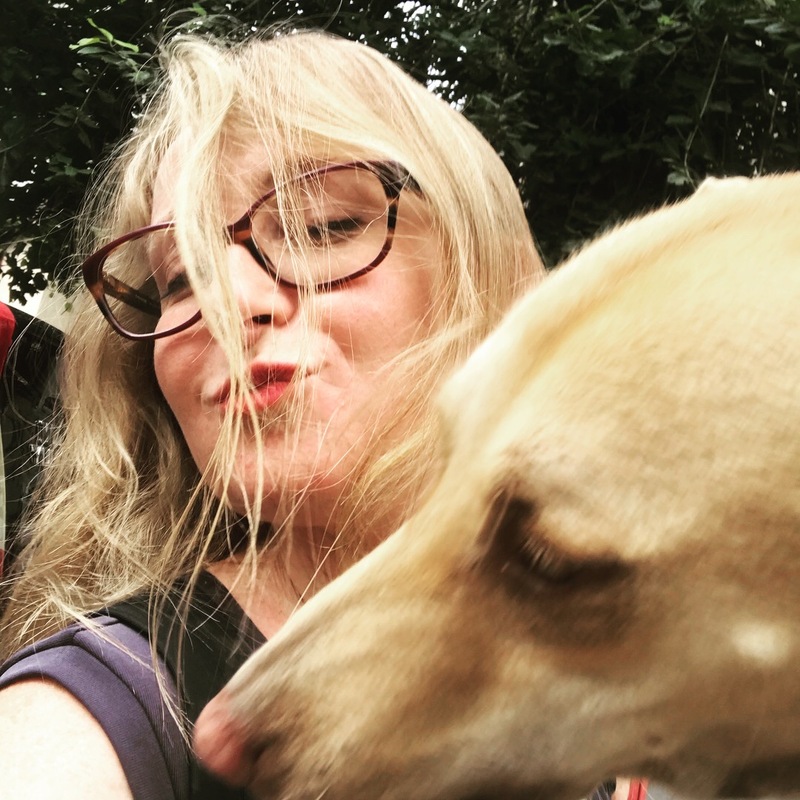 Every classroom teacher probably the world over, faces similar parental queries at the start of a new school year ~ How will my child cope when they don't speak English? Will they last a full day? Are they going to make friends? Can you tell us about the programme? We inherited a baby tortoise and have named it Little Bubbles! It has been a seamless transition to life at CAC and the Pre-K children have been attending school for two weeks already now. I have felt a sense of warmth and belonging from my first moments here. It is an extremely open and friendly community. The children have adapted well to their new environment and we are busy establishing our classroom community. As a collective, they are so inquisitive and extremely keen to grow and learn as much as they can in our year together. Our days have been filled with encounters that have been unhurried and vastly enjoyable. 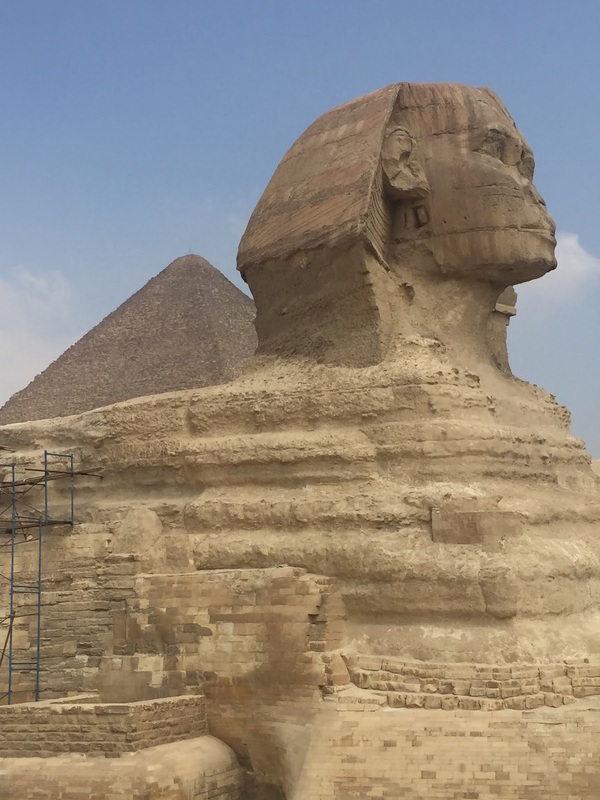 There is so much to see and do in Cairo and it was wonderful to visit Giza with the new hires last weekend to get up close and personal with the pyramids and the sphinx - all a short 30 minute trip from where we live! 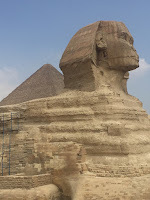 They are such incredible structures and its awe inspiring to spend time in Giza. I have begun to shop with a vengeance and have procured some stunning treasures to add to my collection in Mumbai. But I am still remembering the importance of being balanced! So today, I joined some wise people in the know, who led me to the Le Meridien Hotel for a pool day - all with a view of those stunning pyramids. How could life be any better? I often look back fondly on a previous teacher exchange that I participated in when I was much younger! I was very fortunate to spend a year in Ontario, Canada, as part of a Commonwealth exchange programme. This was my first experience living in someone else's home, alongside assuming their teaching role at school too. In hindsight, it had shades of what I now see as an 'almost' AirBnB scenario, at least on the home front. I arrived to a fully functioning home away from home, equipped with every single thing I could ever possibly need. At school, it meant walking into a classroom that was set up and in those days, all I needed was the hard copies of all my necessary syllabus documents before I got my teeth stuck into the Waterloo Catholic District School Board's mandated curriculum. Times sure have changed and I knew the moment I heard about an exciting new prospect presented to me at ASB in 2017 that applying for an exchange to CAC in 2018 had my name written all over it. After much dialogue with John Smithies and establishing my commitment to being one hundred percent ready, willing and able to be a part of another exchange, the process then meant interviewing and being matched with Trillian! 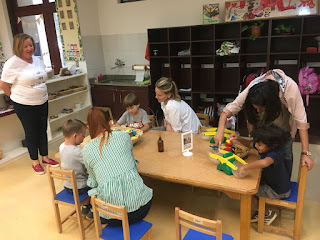 It was a moment of pure joy and immediate thoughts of all that I would learn and devour in my time spent in another early childhood classroom across the seas became a reality. Trillian and I participated in pre-visits to our new destinations and I gathered much information from my time at CAC in March 2018. It was an opportunity to observe, make connections and get first hand knowledge of what to except as we embarked on this exciting renewal programme. 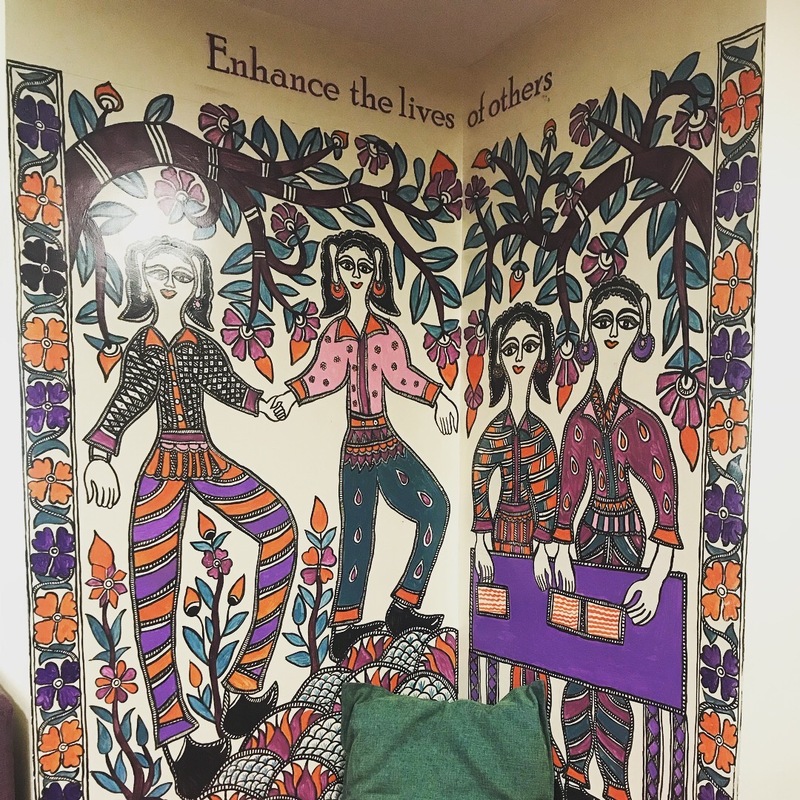 Highlights included meeting my future teaching assistant and spending time in Maadi, which I knew immediately on arrival, would be a perfect place to live, work and use a base for exploring all that Cairo has to offer. I arrived in Cairo to be met by Julie Jackson-Jin, escorted home and then the real settling in began. Trillian had very kindly already shown me all of the local shops, so I retraced our steps and found a beautiful little Fair Trade shop around the corner and made a few purchases. Trillian has a gorgeous apartment that I feel so comfortable in. It is a six minute walk to school and I have everything I need, which is such an added bonus when you are adjusting to life in a new home. The warm and effusive welcome from all members of the CAC team went a long way towards setting the scene for an upcoming year of new sights and sounds. It is clearly a very strong community who devote time and energy to making sure people feel as if they are indeed part of the larger CAC family. Getting to meet a whole new set of people from all around the world and touring the beautiful campus made a lasting impact on my first impressions. The orientation has been fabulous and our first three days together have proven to me that our decision to partake in this experience will be instrumental in taking my teaching and travelling 'skills' above and beyond my wildest dreams. It's always a wonderful sign when there is a healthy balance of socializing, presentations and information sharing sessions for your first three days in a new land. It is at this point that I am eternally grateful to the cast of thousands, particularly John and Julie, that have made this opportunity possible. My fantastic gift - a new school bag! 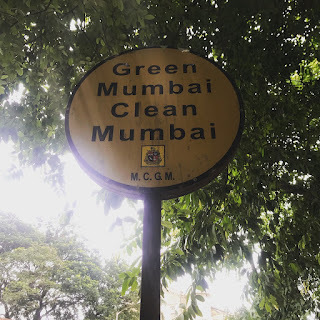 I am writing this blog post from somewhere that I never dreamed I would actually get the chance to live- Mumbai, India! Let me tell you a little bit about how I got the opportunity to live and work here for one year. It all started almost one year ago today, when my head of school at Cairo American College mentioned at an all staff meeting, almost casually, that we were going to be participating in something called a "Teacher Renewal" program and that anyone interested in an exchange year with another school should get in touch with their principals or him to discuss details soon. Interested? I was very interested! I had just begun my fourth year in Cairo, and while I was very happy in my position and with my colleagues, I had realized that part of international teaching meant experiencing new cultures and schools around the world- something that I hadn't done, as my first posting outside of the US was CAC. The Teacher Renewal program was a perfect opportunity for me to try something new, without having to say goodbye to Cairo American College just yet! After setting up a series of interviews with CAC and then with my prospective school, the American School of Bombay, it was a yes! I had been matched with an amazing educator, Samantha, at an incredible school. We were both thrilled about the idea of traveling for a year. I was able to meet Samantha when she came to Cairo for an orientation session in the spring, and she showed me around when I visited Mumbai for a week during my spring break as well. 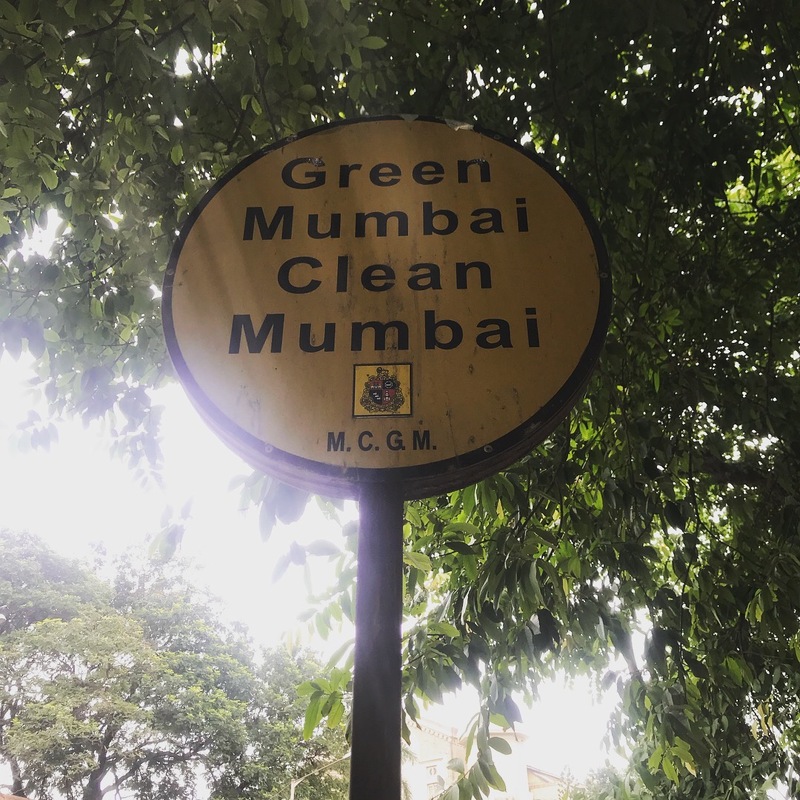 As soon as I landed in India, I knew I had made the right choice. I loved the culture, the climate, the sights and sounds. It was an extremely busy week and I tried to soak up as much as I could between meetings, observing teaching and learning, filling out paperwork, and even some shopping. When it came time for my flight home, I didn't want to leave! 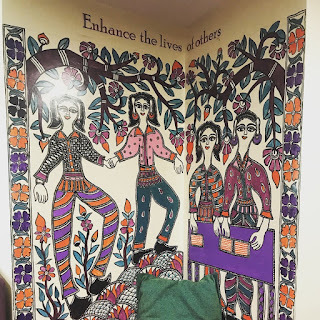 I had a wonderful beginning at the American School of Bombay. The administrative team welcomed all new teachers by placing a flower wreath around our necks and daubing red paste on our foreheads, according to Indian tradition. 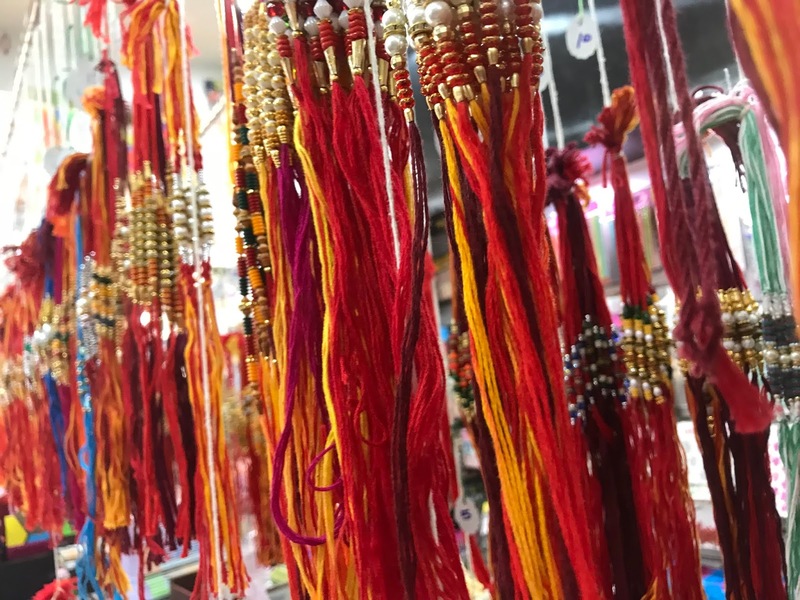 Since my arrival here, I have felt immersed in the culture of India and I see how it flows through and around everything that happens in this country. I am joyfully embracing it as a part of my journey. The teachers have been very busy preparing for the school year. We set up two new classroom spaces this year on the Pre-K floor, and we were so happy to welcome the new families to orientation this morning. Tomorrow will be the first school day for all children at ASB. Now, I am sitting here in my home for the next year- Samantha's beautiful apartment in Bandra. I have had a very smooth transition to India. Since I am staying in Sam's place, I have not had to worry about shipping over my things. In fact, I brought over a few things in April, so I traveled with just two suitcases for the entire year! 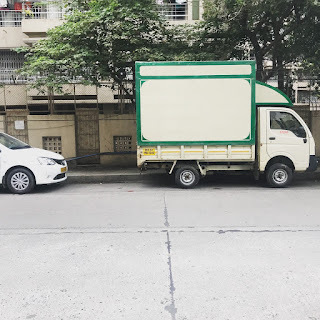 Without an apartment to unpack, or various necessities to find in a new city, the relocation to Mumbai has been so much less stressful that any other move in my life. 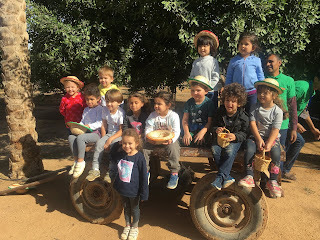 When I visited in April, I learned so much about the routines and expectations of the school day that I feel extraordinarily relaxed and ready as I anticipate the first day of school tomorrow. I know that I am prepared to be a collaborative team member with the other three Pre-K teachers, and I understand how things work here at ASB. I am so happy and grateful to be here. 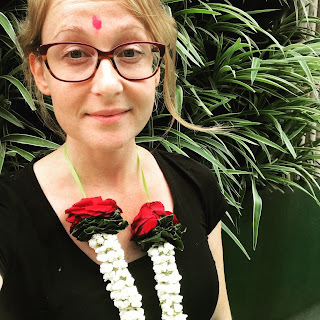 I love India, and after my first week at ASB, I am so enthusiastic about being a part of the team. I can't wait to see what this year has in store for me, and I can only hope that I continue to be a positive contributor and support students, families, and my colleagues here. I know the adventure is just beginning for me during my year in the teacher renewal program.